What are keywords? Why do they matter? How do you find the best keywords for SEO and conversions? I’ve put together this Keyword Research Guide to pull back the curtain on this tricky topic and bring you bang up to date with best practice. As you’re probably already aware, keywords are the words and phrases that describe what your online content is about (more about this below). Search engines crawl and index web pages and then decide which ones to list in search results based on what content seems most relevant to the user’s search. Keywords can help the search engines to understand this. How we use keywords has changed over the years. To rank highly for a search term, webmasters used to focus on keyword density, stuffing copy full of the same keywords to drive home to search engines what each page was about. But this didn’t make for a good user experience. Copy that was repetitive and poorly written could rank higher than informative, natural-sounding, relevant text because people were able to game the algorithms. Over time, these became ‘black hat’ (bad) techniques. The search engines rightly decided to prioritise the user experience and, because the way we use keywords changed, how we do keyword research changed too. As we mentioned above, keywords are the words and phrases that identify what people are searching for and that describe the topic of a web page. For the best results, you should be writing about the topics for which people are searching. Ideally, each page should have a single topic focus with links to related content or side topics. It’s best to aim for a unique keyword for each web page as you don’t want to end up competing in searches with your own content. Although Google announced back in 2009 that it wouldn’t use the keyword tag as a direct ranking signal anymore, it’s fair to say that keywords do have an indirect impact. Search engines use keywords to help them decide what the content of a web page is about and where it should rank in a search, based on its probable relevance, trustworthiness and authority. Equally, website visitors will scan a web page for obvious keywords that highlight whether the page will contain the information they’re seeking or whether they should ‘bounce’ away to find another, more relevant website. Keyword research can help you understand the topics that really matter to your audience at any given point in time. You can use this information to inform and support your content strategy by creating content that you know your audience is looking for. You can also find out what keywords your competitors are targeting to help you to grow your web traffic in the same area or identify gaps in the information available that you can fill to differentiate your business from its competitors. In Google’s Search Quality Evaluation Guidelines, example pages are assessed based on the extent to which they answer the intent of the searcher. Search engines want to know that, based on the most popular reasons to use a search term, the majority of searchers would find exactly what they need on a page for it to rank well. For this reason, it’s essential to understand why someone would look for specific content and to focus your keyword research around this intention. Knowing this, the effective use of keywords is about choosing a topic and sticking to it, supporting that topic with related content, answering questions, and thinking about how people are searching and why. Google’s introduction of ‘Answer Boxes’ near the top of page one of SERPs shows just how much the search engine prizes relevance. The answer box features copy from just one website that appears to best answer a specific question (see the ‘What is keyword research?’ example above). This pulls out the copy from the chosen site, highlighting the relevant keywords, so that people can find the information they need without even needing to visit the website in question. Visitors can then click on the link to read the page in full, if they so wish. People are likely to make different styles of searches based on whether they want to do something or know something, and whether they’re seeking broad information or something specific. As we explored in a recent blog about how artificial intelligence is shaping SEO, the actual devices that people use to search have changed too. More and more of us are using voice searches via our mobile phones or using digital assistants such as Siri or Alexa. The search engines need to understand the context of that question, e.g. the searcher’s location and that people usually mean the weather local to them when they talk about a ‘forecast’. This search is far different from the ‘Newton Abbot weather’ search that someone might do on a desktop. 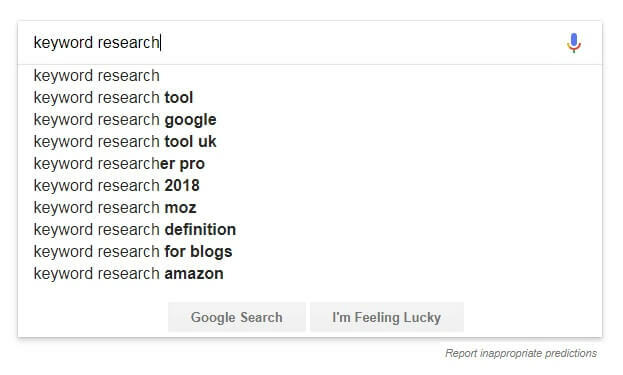 The search engines’ algorithms have a better understanding of natural language these days, recognising that different words and phrases can be used to describe the same topic. Therefore, when writing web copy, we can afford to vary the language we use to discuss a topic, as long as it’s relevant. The search engines also recognise that the same words can apply to different topics, which is why context is so important. By using different words to describe a topic, we can help to give the search engines more context to draw on to return the correct results. For example, if you wrote an article about Jaguars but included other phrases such as ‘big cats’, ‘Panthera’ and ‘carnivore’, it would help search engines to understand that you’re writing about the animals, not the luxury cars. Google also uses mathematical entities known as context vectors in its algorithms to look at other searches the user has made and how they’ve interacted with those search results to understand what information they might be looking for. Long-tail keywords account for the bulk of web traffic. Although they tend to attract less search traffic per phrase than head and body keywords, long-tail keyword traffic has relatively high conversion rates because of how specific the phrases are. Imagine you are a woman who needs to find the perfect pair of black shoes for a black-tie dinner event. 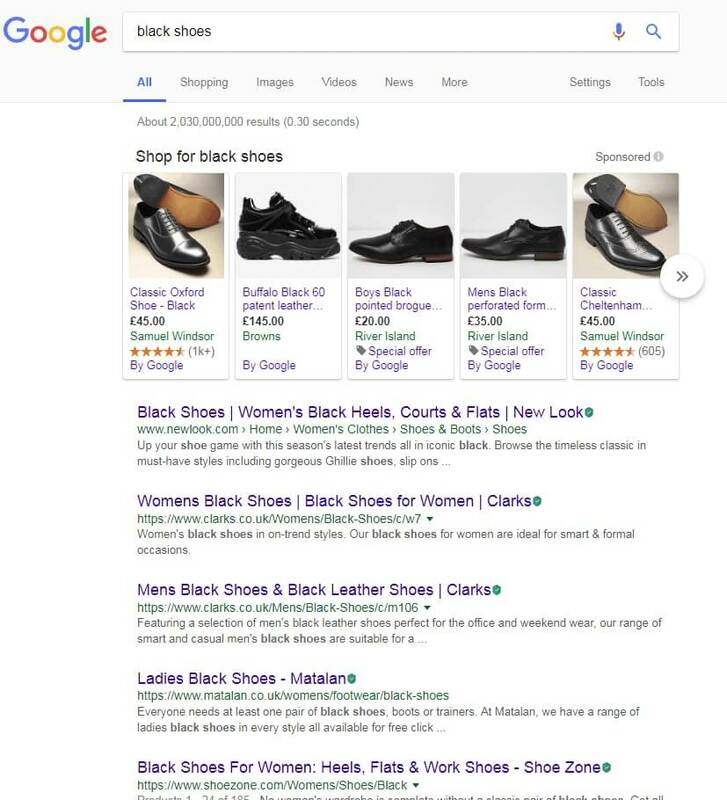 A ‘head’ keyword search might be ‘black shoes’ but this brings up more than two billion search results! The search engines need to know more to narrow down the results. After all, are you looking for black school shoes, black shoes for men, black boots, black sandals or something else altogether? 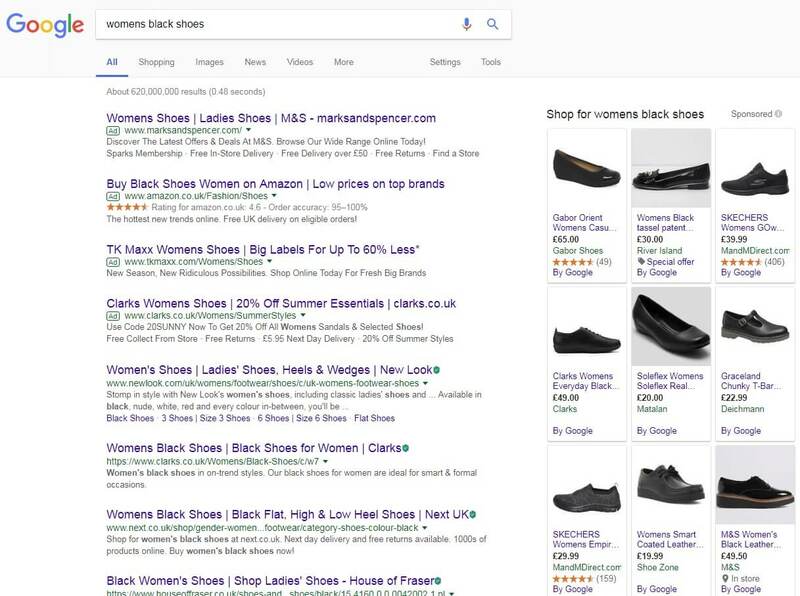 You could narrow down the search some more with a ‘body’ keyword search of ‘womens black shoes’, which slashes the search results to from two billion to 620 million but that’s still like looking for a needle in a haystack. Plus, as we can see from the screenshot below, none of the pictured products scream ‘evening do’! Your best bet to make your search as effective as possible is to add in some descriptive elements and opt for a long-tail keyword such as ‘womens black evening shoes kitten heel peeptoe’. 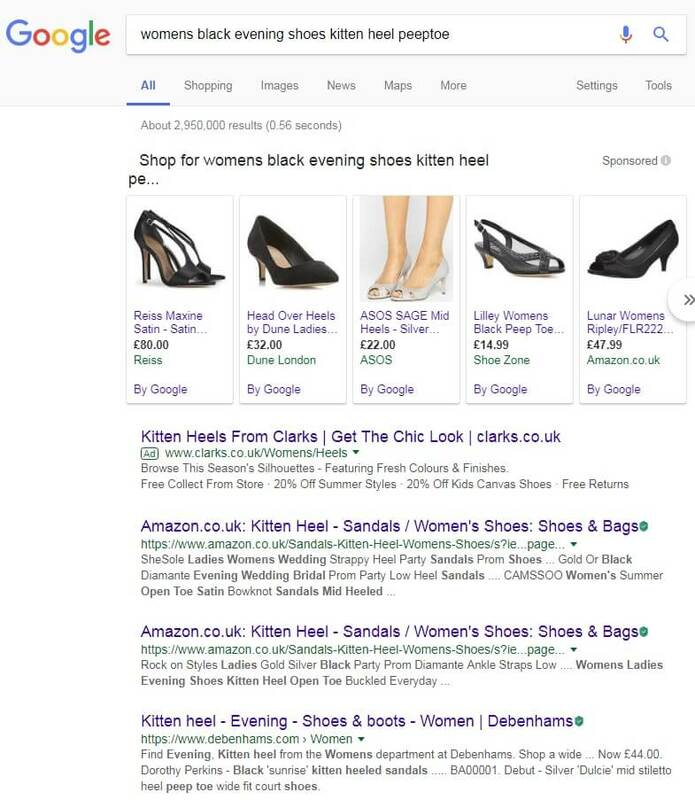 This will shrink the search results to under three million listings – still a lot but the majority of the results feature shoes that might fit the bill for your footwear requirements. 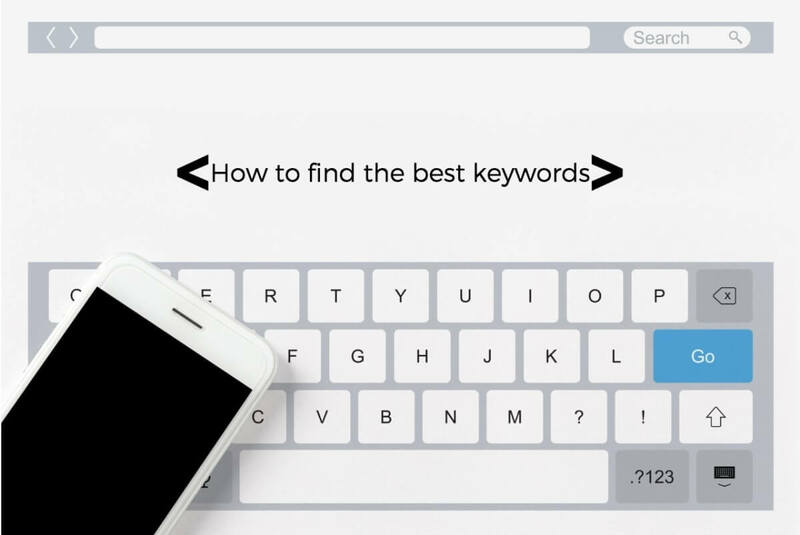 From the retailer’s perspective, yes, there might be fewer people using this long-tail keyword to search but there’s also less competition and a much higher chance that the searcher needs the item described and will, therefore, make a purchase. For this reason, long-tail keywords are often described as low cost and risk with a high probability of conversion. Mind you, there is a caveat to this. Long-tail keywords work well for optimising product descriptions but, with the rise of voice searches, so-called ‘middle-of-the-pack’, medium-tail keywords seem to be performing better for blog articles and cornerstone web pages. These are phrases that are not too generic nor too specific but describe the overarching topic of the page. The secret to the most effective keyword research is understanding the reasons why people are searching for your content, whether you’re selling products or services or you want to attract more readers to your blog. Informational searches where users search for the answer to a question, e.g. what kind of mobile phones are currently available? Navigational searches where users search for a particular website or brand, e.g. users go to URLs for specific phone brands. 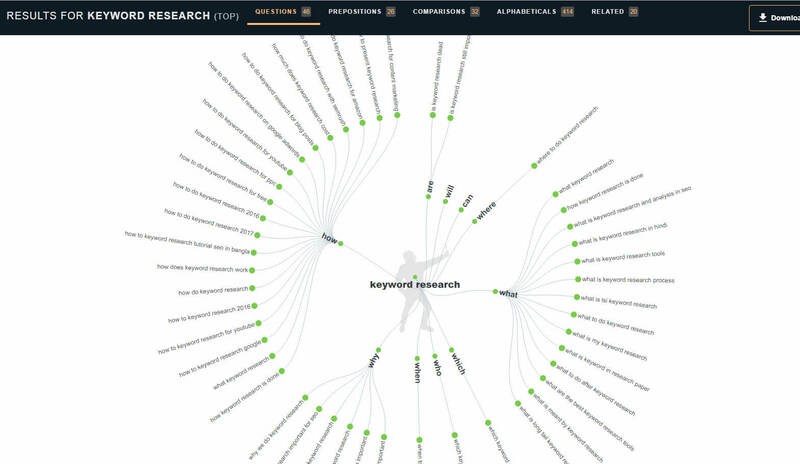 Investigation searches where users search for information that may lead to a transaction, e.g. users compare the features of several different phones to see which best fits their requirements. Transactional searches where users are ready to buy, e.g. where readers go to a page featuring a precise product description that includes the option to buy. 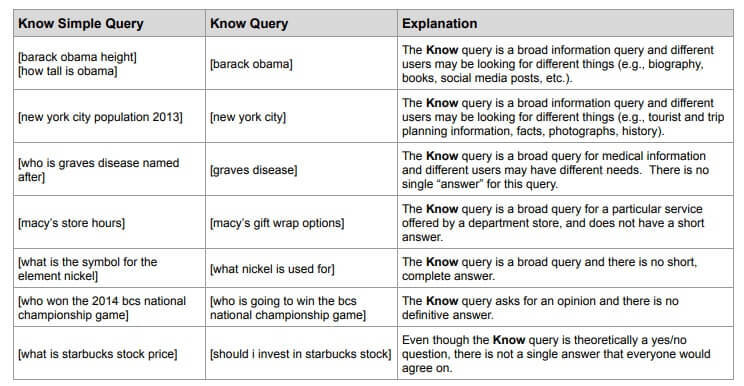 Know/Know Simple – this is when users want to find information or the answer to a specific question. The intention of the searcher will change the kind of keywords that they use. People will also adapt their search based on whether they’re using a desktop, laptop or a mobile device to type a search or whether they’re using an Intelligent Personal Assistant (IPA)/digital assistant to make a voice search as we discussed above. It isn’t enough to say that you want to bring more traffic to your website. That won’t determine your success – unless you have plenty of time, money and your philosophy is that if you throw enough balls you’re bound to hit a coconut eventually! You might need to be creative in how you approach your keyword research. Although it would be tempting to have a website full of the ‘money phrases’ we mentioned above, they’re also incredibly competitive and high risk/cost. Sometimes it’s better to take a less direct route to a sale, concentrating instead on creating content that builds your authority and reputation in your field. If you can rank highly for medium- and long-tail keywords, Google is more likely to rank your content for the money phrases too. A good starting point is to write down the search terms you would use to find specific information. When you have a list of phrases, pop them in Google to see what search results come up. 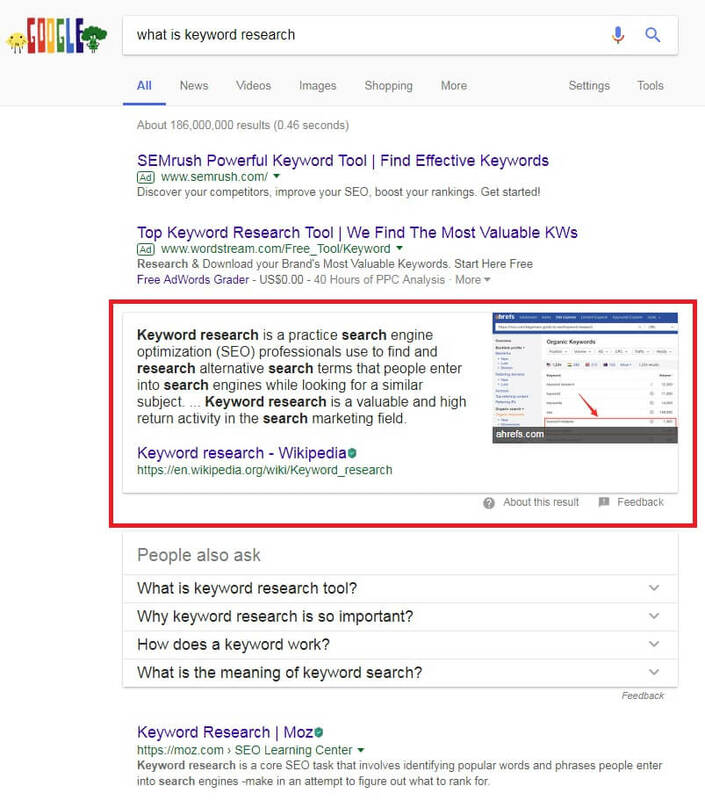 Do the search engine results pages (SERPs) reflect the information or answers that you were looking for? Do you have to modify your search to bring up more relevant results? Make a note of the phrases that bring up the best search results. You will also want to think about the information that your audience wants from you at different stages in their buying journey. What sort of questions do they ask on social media or via the different ways of contacting your business? What hashtags do they use? What do they say when they comment on your blog articles? This could give you some insights into keywords for your customers. There may be keywords that tie in brilliantly to your business and your audience that you haven’t thought about before. Tools such as Answer the Public and LSI Graph – see below – can provide you with phrases related to your main keyword and might inspire you with some future blog topics. Another handy tip is to enter your main keywords into Google one at a time and scroll to the bottom of page one of the search results to see what other terms the search engine has listed as related terms. 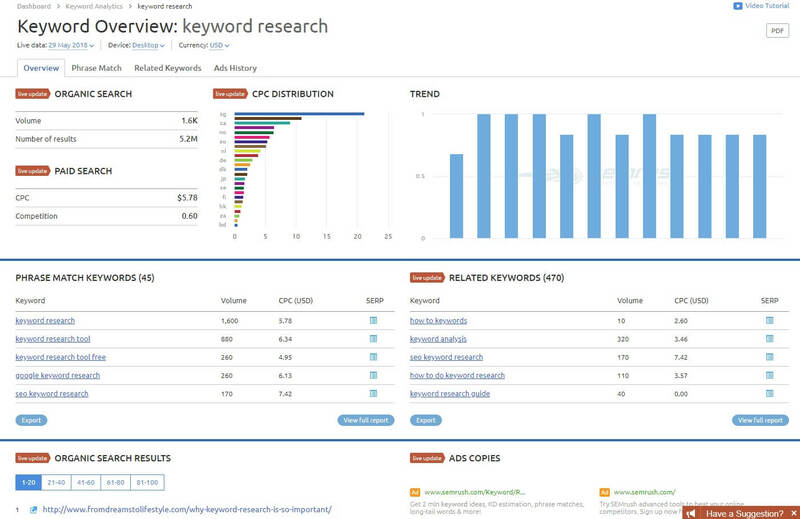 Use the Ahrefs ‘Keyword Explorer Tool’ to generate keyword ideas, carry out an in-depth analysis of specific keywords, view metrics for keywords, review potential search volumes, view other related keywords from the top 10 pages that rank for a chosen keyword, and access autocomplete search suggestions. Ahrefs includes an at-a-glance indicator of keyword difficulty, i.e. how difficult it will be to rank for different keywords. Simply type in a keyword and Answer the Public will return a graphic of related long-tail phrases and question suggestions with links to the search results for each. This is great for optimising your content for voice searches. Although the Google AdWords Keyword Planner is a tool to help people plan their PPC AdWords campaigns, it can also give you a good steer on potential keywords for your organic web traffic. Login to Google AdWords and go to Tools>Keyword Planner (see above) and choose between the options ‘Find new keywords’ or, later, ‘See search volume and forecasts for your keywords’. As an example, I entered ‘keyword research’ in the ‘Find new keywords’ option and was given a list of 539 related words and phrases with data about their search volumes and competition. Google Trends is a fantastic free tool to keep an eye on the topics – and keywords – that are trending up or coming down in popularity. It can also help you to work out regional and seasonal patterns that might affect your keywords and your content schedule. Two searches are available free of charge or you can sign-up to get five free keyword searches per day. Alternatively, there are paid-for packages for more in-depth information and a greater number of searches. Enter a keyword and KWFinder’s keyword generator will return a list of related search terms with their level of difficulty/competitiveness. You can also see which content is ranking highly for this search term across the web. Simply type in your main keyword and this tool will return a list of related words and phrases. Research potential keywords for organic and pay per click (PPC) campaigns. Explore phrase matches and related keywords, as well as long-tail keywords, the potential cost per click and search volumes. This tool is a good alternative to the Google Keyword Planner that shows you search volumes, related terms, estimated keyword value and more. Simply enter one of your main keywords and the keyword tool will give you a list of similar and related terms, including the daily search volumes on the major search engines, the cost per click and value of the keyword. SEO PowerSuite gives you access to a host of free tools that analyse your website and make keyword suggestions. Enter a URL and see which keywords it’s already for. Plenty of helpful information can be accessed free of charge. Serpstat also offers a choice of packages if you want to use the more extensive suite of tools. Just enter your chosen keyword(s) for a breakdown of the related organic and PPC phrases, how the keyword is trending, the keyword difficulty and competitors’ performance for the same keywords. If you already have a website rather than starting up a site for the first time, Google Analytics and Google Search Console can provide you with valuable information about the keywords people are using to find your web pages. In Google Analytics, you need to go to Acquisition>All Traffic>Channels and click on ‘Organic search’ in the table. These days, the keyword data you can see – especially if you haven’t linked your Google Search Console to Google Analytics – is quite limited. It’s likely that in position one of the ‘Organic search’ table, it will say ‘(not provided)’. Depending on your search volumes, there may be some keyword data in position two and onwards. Don’t despair, there are other ways to access keyword data. If you have linked your Google Search Console account to Google Analytics then stay in Analytics and go to Acquisition>Search Console>Queries. This will bring up a table of search terms people have used for one of your web pages to appear in SERPs. Alternatively, you can go into Google Search Console itself. If you haven’t registered with Search Console, here’s a great tutorial from Moz to follow to get you up and running. Once in Google Search Console, you need to click on the web property you want to view if you have more than one website. You will then be taken to the dashboard for that site. In the left-hand column, click on Search Traffic>Search Analytics. On this panel, make sure the Queries option is selected and tick Clicks, Impressions, CTR and Position. As well as a list of the Queries (keywords) people have used to see your content listed in SERPs, you’ll be able to see the number of impressions (times your pages appeared in SERPs), clicks (number of times people have clicked through to your website from a SERP), the click-through rate (percentage of impressions that became clicks) and your average position on Google for the search term. Are there any search terms that appear to be attracting plenty of impressions and clicks but that don’t rank in the top five positions on Google? If so, click on the search term and then select the Pages option (next to Queries above) to see which page Google is ranking for that search term. It might be worth going into the page and adding the popular search term into the copy (see below to find out where). Having carried out your keyword research, I thought I would add a few pointers about where to use keywords in your content. I really want to provide as much value as possible in this Keyword Research Guide. You don’t need to slavishly adhere to these rules – (there is no magic formula for keyword density + keyword placement = page one ranking) – but they can help to summarise what the content is about at a glance. The SEO title tag should ideally contain your main keyword as near to the front of the tag as possible. This is the header that people will see in SERPs, so try to accurately reflect what the page is about. The meta description is the description below the headings that people see in SERPs. This can persuade people whether or not to click on your listing, so try to include the main keyword while making the meta description a compelling, benefit-led call to action. The main heading (H1 tag) of a web page is typically where people look first to work out what the page is about. If you use a heading that reflects the overarching topic of the page, it will help people – and search engines – to spot the relevance to their query at a glance. As people often skim-read online text, subheadings are a fantastic way of breaking up the copy, signposting what each section is about and using keywords that relate to the main topic of the page. A keyword-focused URL can be an immediate way of showing that the content is relevant to a specific search query. It can also make it easier for searchers to guess what a topic-specific URL on your site might be, bringing important direct traffic to your site. Throughout this article, I have linked to sources of further information so that if you want to read more deeply into related topics, you can. The text used in the links includes topics such as ‘context vectors’, ‘medium-tail keywords’, ‘Google Search Quality Evaluation Guidelines’, various keyword research tools and more. This helps users and search engines understand how the content on my website ties together and provides sources and citations for an external reference. It’s often suggested that the opening paragraph of a web page should include the main keyword as near to the beginning as possible. Again, this is to tell searchers and search engines that the content is staying on topic. It pays to think about where people look when they’re skim reading content. Try incorporating keywords into text that’s in bold or bullet points as people are likely to pay attention to these. As search engines can’t analyse images, alt tags help them to understand what an image is and how it relates to the content of a page. They are also important for anyone using screen readers to view a web page. It’s a black hat tactic to stick loads of keywords in your alt tags but one clear tag per image that encapsulates what the image is can be helpful. Including keywords in the call to action or summing up at the bottom of a web page/blog article can again help to show the ongoing relevance of the content to a single topic, especially to people who are skim reading. It’s advisable to use your chosen keywords as hashtags when you share your content on social media. This will encourage people to identify specific keywords with the shared piece. Keyword research is important because it helps keep you focused on what your audience wants and to achieve clarity when creating your content. But before your potential audience can read the content you create for them, they have to be able to find you. Using the right keywords is like adding a key to a map – it vastly increases the chances of your content being discovered. As I hope I’ve made clear in this keyword research guide, the most important thing when writing for the web is to aim for relevance, context and reflecting the search intent of visitors. Do that and you’ll find your main keyword and related terms should occur naturally. In turn, you should see better rankings, more clicks and conversions. The most important element of a successful SEO strategy is choosing the right keywords to target. We use powerful keyword tools to do our research; we also analyse the competition and the data in Google Analytics and Google Search Console to identify the best keywords to target. Our Keyword Research service will provide you with the main focus keyword, long-tail keywords, and related terms – this is known to be the most effective strategy for building up authority for the competitive keyword. If you’d like an expert to do the hard work for you and find the best selection of keywords for each of your topics or pages, contact me here. This is a pretty comprehensive guide to keyword research. I think you covered all the bases. Your post was an extremely catholic article focusing on keywords. Should benefit new bloggers and seasoned ones alike! Thank you for creating this work for all of us in the blogosphere. Thank you Dexter! The shares are very much appreciated. Hi Hazel, About all I can say is “wow.” There is so much great information here that I just might have half a chance at keyword research from now on. I do very well when I’m reading an article about SEO and understand it but when it comes to doing the research for my own site or post I’m working on, I kind of get lost in what I’m doing. Thank you for the links to the keyword tools. I’ve gotten so irritated with it (keywords) that I just do the best I can but it doesn’t always work out so well. Fantastic information in here, thank you. Hazel, this is one of the best keyword research guides I have ever read. Again, you remind me how important keyword research can be. Relevancy & User Intent is the key. You have nailed it! Thank you so much Jubayer! I have not had time to do keyword research in so long that I forget all about it (other than using the Yoast plugin). Keyword research is most important for a blogger to find the low competition keyword with high search volume. Still, most of the bloggers are not able to understand the importance of keyword research. This article will help all to find the best way to do keyword research. Thanks for sharing. I think we need to come up with different terminology now other than keyword research cause it is changing fast. We no longer need to add the same keyword throughout our articles and we don’t need to hit a magical % to be optimized for a phrase because Google can understand what you are writing out if your content is good and just makes sense. Like for example, it knows that an SEO course is extremely closely related to SEO class so as long as your using good related words then your optimized. Of course, this kind of thinking brings into question the use of all SEO plugins. Yoast, for example, will push you to mention your keyword around 6 times per 1000 words but that is really an old style of SEO now. If you are going for long-form content then it is quite hard to hit Yoasts optimization requirements but the beauty of long-form is that you have more space to optimize for multiple keywords and lots of related phrases and this only helps Google understand what your writing about. profitable keywords, you are missing the basics of SEO. To get organic traffic from search engines you need to be SEO optimized. Directly signaling search engines with your content is part of on-page SEO when you write content and optimize it to rank in search engines. Thank you for this great research on keywords. Saved for my research and shared. This keyword research guide was extremely helpful. We cannot just randomly pick out the keywords and add them to the content. We need to check the user intent and the relevancy of the keywords to the post. And even a low keyword competition with high search volume benefits the blogger but it is not of understanding to many of the bloggers even now. Anyway, thanks for such a thorough read. Many useful tips.